Through the first half of the 2018 Major League Baseball season, the Boston Red Sox have played exceptionally well and reached the All-Star Break with the best record in baseball at 68-30. 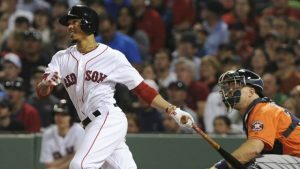 Boston over the last week opened a 4 ½ game lead over the second place New York Yankees in the American League East. However, the fine play by the Red Sox has gone unnoticed by odds makers as the New York Yankees remain at the top of the list with the shortest odds to win the 2018 World Series at +375. Close behind the Yankees with the second shortest odds are the defending World Series champions Houston Astros sitting on +400. Last postseason, the Astros defeated both Boston and New York on its way to winning the World Series for the first time in franchise history. The Red Sox have the third shortest odds to win the 2018 World Series at +750. Following the All-Star break, the Red Sox will play the Yankees 10 times more before the end of the regular season. Currently the Yankees hold a one-game edge at 5-4 in head to head action with the Red Sox this season. The Cleveland Indians struggled the last week to 10 days as their lead in the AL Central was cut from 12½ games to 7 ½ in a little over a week after losing 6 of their last 10. However, the Indians are currently +1200 to win the World Series. In the National League, the Los Angeles Dodgers and Chicago Cubs are amongst the favorites. The Cubs and Dodgers have won the last two NL pennants. The Cubs are currently +800 to win the World Series while the Dodgers are close behind at +900. However, two other teams that could play dark horse rolls during the postseason are the Arizona Diamondbacks and Milwaukee Brewers. Milwaukee is currently in second place in the NL Central 2 ½ games behind the Cubs and sits at +1200. Milwaukee limped into the All-Star break losing 8 of its last 10. Arizona is currently +1600 to win the World Series. The D-Backs after leading the NL West much of the first half of the season were overtaken by the Dodgers and trail LA by a half game. The Philadelphia Phillies made a big move prior to the All-Star break to move into first place in the NL East by a half game and sit at +2000 to win the World Series.